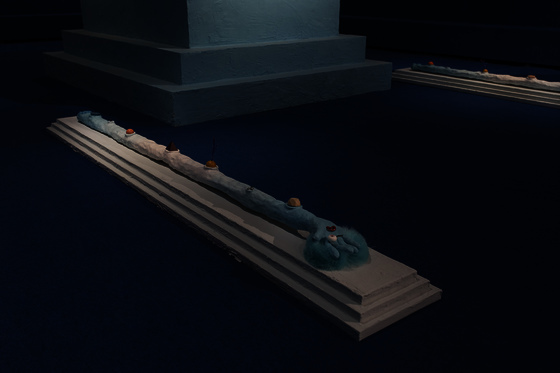 Andromedan Sad Girl is the first major collaborative exhibition by artists Florence Peake and Tai Shani. 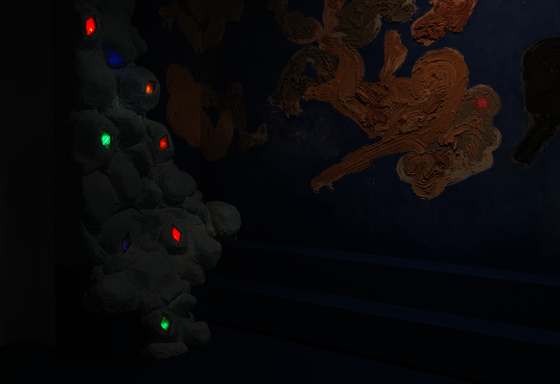 Drawing on their research into structures of feminism, their immersive installation is an imagining of what a pre or post patriarchal site could be. 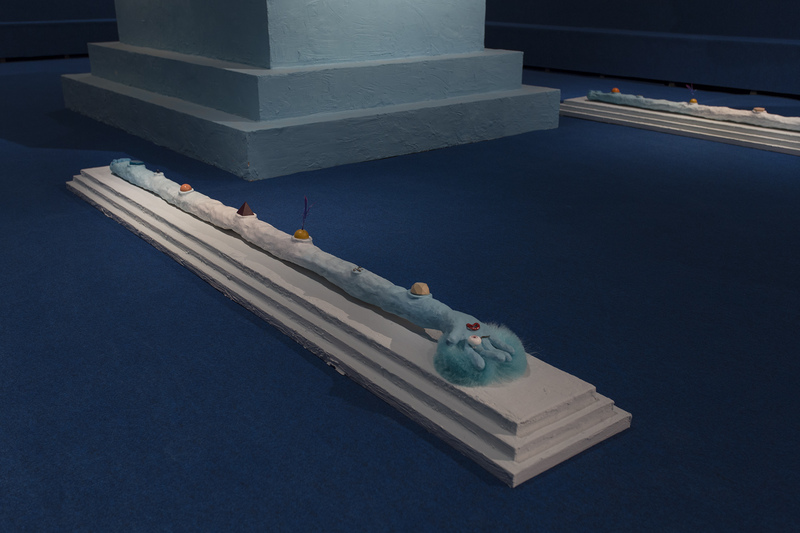 Peake and Shani are interested in exploring the fluid mythologies and imagined futures of lost civilizations. The artists take an archaeological excavation as a point of departure to imagine and represent non-hierarchal, pre-historical or futuristic civilizations, imagined through ambitious new sculptural works and wall paintings. 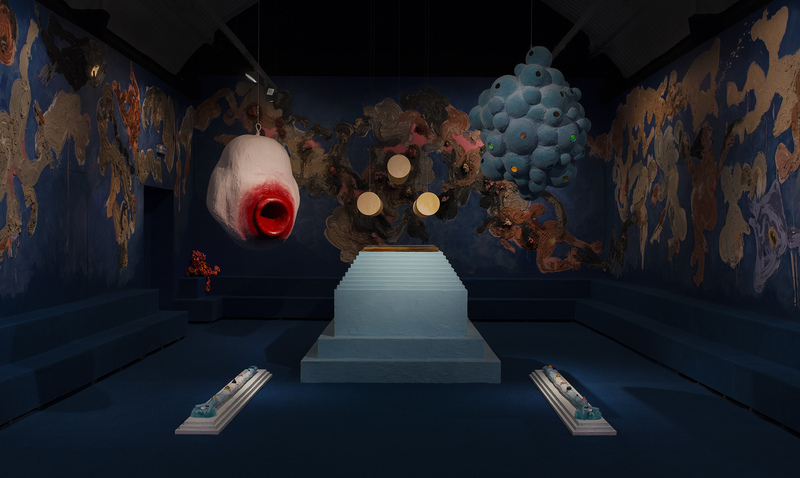 The installation marks a conceptual collaboration between the two artists, with Tai Shani’s sculptures surrounded by Florence Peake’s paintings. Drawing on her performance practice, Peake has collaborated with dancer Eve Stainton to generate the new fresco paintings. By drawing around each other’s bodies on the horizontal surface, before painting on the panels vertically, the work suggests a plurality of abstract embodiment and vibrating temporality. Tai Shani’s work occupies the central gallery space and frames the gallery entrance with vibrant symbolic sculptures; technicolour, psychedelic interpretations of mystical objects and ritualistic architecture. 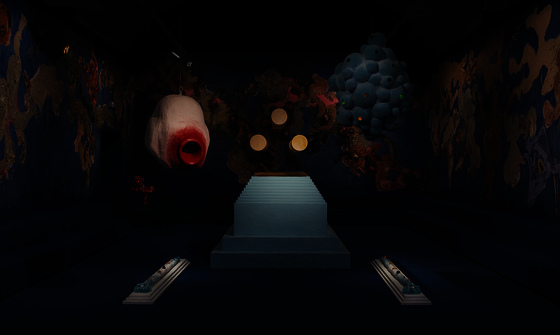 The installation, which has transformed Wysing’s gallery, privileges sensation. Entering the space, the visitor crosses a voluminous threshold towards an altar, flanked enigmatically by long hybrid arms, both human and animal. 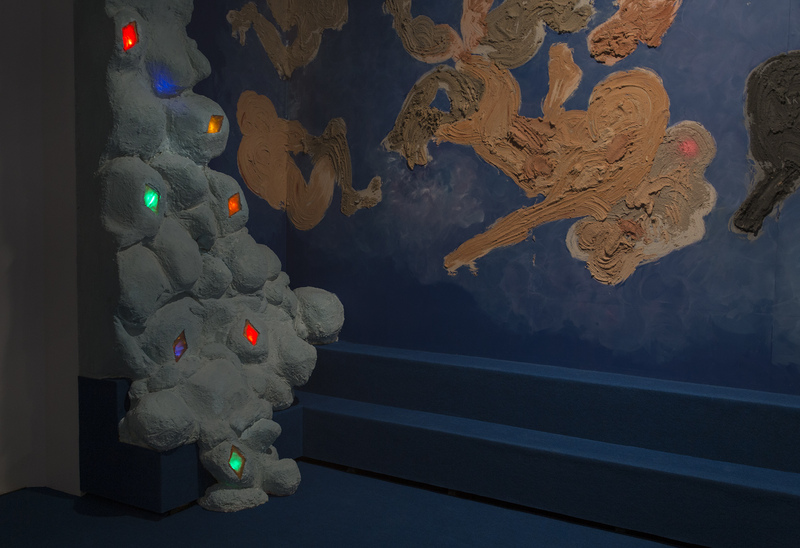 Sculptures are flocked to create soft and sensuous objects, and walls have been painted with a vivid and gestural application of coloured plaster and ceramics. Using multilayered elements, including sound, the whole installation takes the visitor to a highly theatrical space and invites them to rest inside this immersive environment. The sound, with vocals from Florence Peake and produced in collaboration with recent artist residency and composer Maxwell Sterling, suggests a pre-linguistic dimension where speech is not yet acquired, but open.